or because I will soon be Mrs. H- I'm really not quite sure! What I do know- is that I have reached 500 followers and think you all deserve something extra wonderful to show you my gratitude and just how much I enjoy being here everyday with all of you! and you are on your way to winning a $75 giftcard from them! Comment telling us what your favorite item/s is/are! I've been a happy follower! Love the gray & white striped napkins! i've been following you for a couple weeks now! I actually just pinned luxury monogram pillows on my pinterest this morning. I love them! I've been a follower of your blog for the last couple of weeks and would love to have the pink and green zig zag pillow in my new apartment. I'm loving the pillows!! I love the white throw pillow. I would monogram it in light blue to match my living room : ) I'm a follower! I liked luxe + lillies on facebook! I love the Black and white stripe placemats. I LOVE the suzani pillow and the chevron placemats !! I just did a post about her fabulous new line as well. Liked luxe and lillies on facebook as well !! I love their pillows so much! And have been a happy follower for some time now! I am a follower of your AMAZING blog! 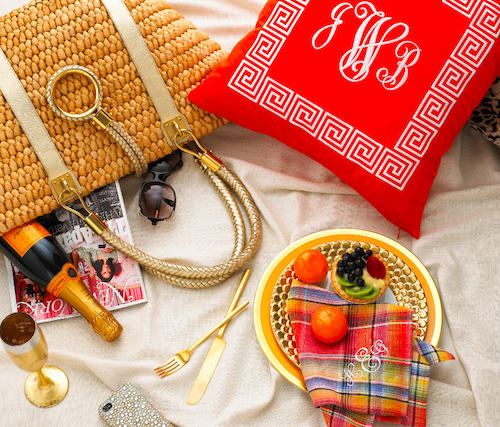 MY must have LM item is the the monogrammed orange throw pillow! I am in LOVE! have been following for awhile and liked the facebook fan page! The black and white trellis tote is my Fav!! So cute!! I have been a follower of luxe and lilies!! I'm a fan of Luxe and lilies on Facebook!!! I follow luxe and lilies on twitter!! Oh, the striped place mats are cute too!! Would love a black or white pillow for my daughter's room! 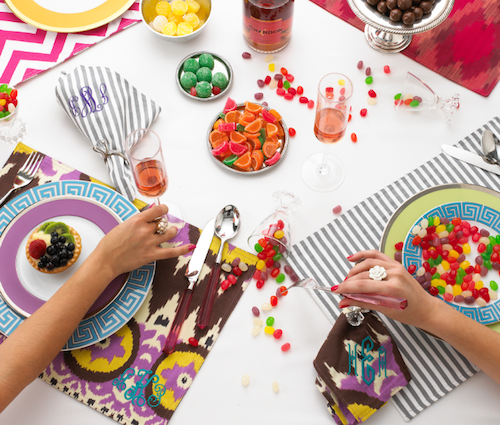 Such a great site - definitely one to bookmark for wedding shower season! Off to tweet about the giveaway now! Oh gosh - so many to choose from! Purple Suzani Throw Pillow has me SWOONING. I love the orange throw pillow or turquoise. Great giveaway--beautiful fabrics and monograms are the best!!! I am a follower here, on Twitter and like your Facebook page, like Luxury Mongrams on Facebook and tweeted about the giveaway so I think I have all of my bases covered. Pick me, pick me! The tribal pillow is awesome. I followed and liked. I'm definitely a follower and like LM on FB with my personal email. I love the pillows, especially the yellow chevron. Thanks so much for the chance at this awesome giveaway! I'm also following you on Twitter @soalaurable! Thanks for the very fun giveaway. I'd LOVE the black and white chevron pillow! It's a toss up... the black and white chevron pillow or the Monogram black check napkins. In the words of one Mrs. Rachel Zoe - I Die. i love the hot pink chevron pillow. super cute! i follow luxe & lillies blog! i like luxury monograms on fb! well i tried to find you on facebook but it's blocked on my pc and i can't find you through my cell phone...but if i could i would totally follow & like! You know so well my love of all things monogramed! I must have the chevron placemats they are to die for! Oh and the pillows who wouldn't want a bed covered in them! You of course know I like and follow you all the ways I can! I really like the pillows!!! My pick would be the black and white chevron! love everything! I NEED the hot pink chevron pillow! love it ALL! 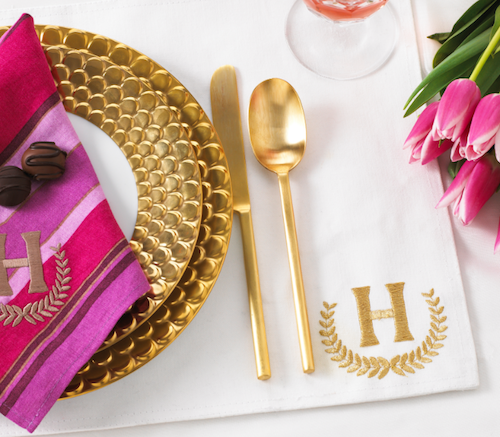 The monogrammed chevron placemats are way cool! I love everything - but my fave is the Pink & Green Zig Zag Throw Pillow. I'm a follower of Luxe + Lillies. With the monograms added, they make ordinary things look personalize but at the same time more classy. I would pretty much take anything from there but I esp. love the pillows! And now I'm following L+L on twitter! Thank you! I'm a follower and liked LM on Facebook! My favorite item is the chevron print placemats and I'd add a teal monogram on the lower right corner. Hi! I am a follower, and now following on facebook. 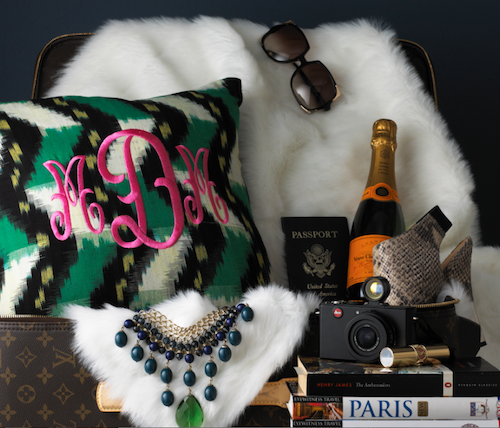 i absolutely love the ikat pillow with monogramming! Amazzzing giveaway! I am a follower. I love the napkins. Even if I do not win I am going to order them but this would help a lot! I'm a follower and will like Luxury Monograms on FB! i like Luxury Monograms on facebook!! i am loving the black and grey Ikat placemats!!! I hope its not too late to enter! I liked & followed. I really love the navy linen throw pillow & blue ikat pillow! i'm following - love the placemats! RULE OF THUMB: TAKE AWAY OR ADD ONE?